It occurred to me that I haven’t done a blog giveaway ever since my first NEXT giveaway I did last year. Since I am almost at the 100K Blog hits mark I thought this would be the perfect time to mark the occasion and also give a little back to you lovely lot for all the support you’ve given me through my blogging journey. Anyhow, back to the giveaway! 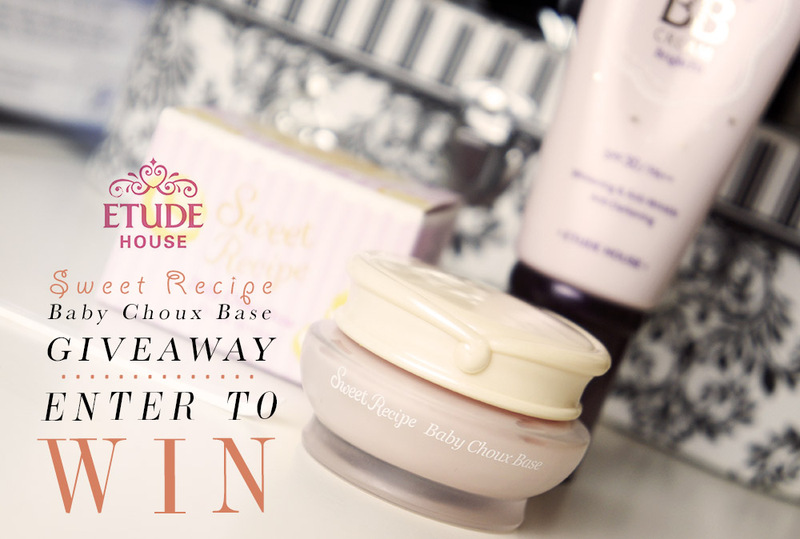 This week I am offering you guys the chance to WIN this Etude House Sweet Recipe Baby Choux Base PLUS 3 x Sachet Samples of the Precious Mineral BB Cream Bright Fit too! The Baby Choux Base is a gorgeous makeup base that helps to brighten the complexion and provide a good base for your foundation or BB cream. 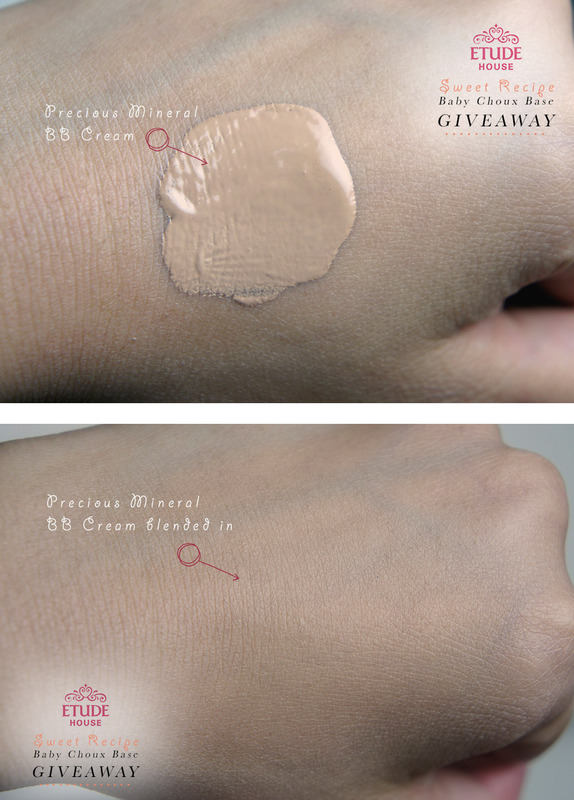 It is recommended to work well with the Precious Mineral BB cream for a flawless finish. Baby Choux Base really reminds me of cake icing especially the fluffy texture that it has. It’s lightweight and applies like a dream. I love how it instantly gives my skin a brightening effect. A little bit of the stuff works wonders though, so remember to be light handed with it. I bought the Precious Mineral BB Cream from Hong Kong a while ago, however even though I quite like the finish, you can see from my photos that the colour doesn’t quite match my skin tone and gives my skin a bit of a grey cast. I find the Baby Choux Base helps a little by adding more warmth to the finish though. Despite the wrong colour, you can clearly see that these two products give a beautiful soft focus finish. TO ENTER YOU MUST BE A FOLLOWER OF THIS BLOG. EITHER BY EMAIL SUBSCRIPTION OR BLOGLOVIN. IF YOU ARE A FELLOW WORDPRESS USER SIMPLY CLICK FOLLOW. LEAVE ME A COMMENT TO LET ME KNOW WHICH POSTS OF MINE YOU ENJOY READING THE MOST OR LEAST! AND LEAVE ME YOUR CONTACT DETAILS SO THAT I CAN REACH YOU SHOULD YOU WIN! You can also enter via Rafflecopter HERE. The competition opens 06/10/13 8.00pm (UK Time) and will close on 20/10/13 8.00pm (UK time). Tags: Baby Choux Base, BB Cream, Etude House, GIVEAWAY, KOREAN COSMETICS, Sweet Recipe. Bookmark the permalink. I’m new to your blog, but I love it! I love makeup tutorials and I really liked your cateye instructions! Very cute! Hi ! I am a new follower, so far i love your blog ! Keep doing more makeup reviews, especially for asian products, we love them ! hello! I’m in your blog but I took a look in your posts and I loved the hair reviews, mainly the toning post .. I’m curious about the asian dyes! My fave kind of posts are hauls and beauty reviews!